David Messent / Getty Images. Rickshaws might almost be retired, but their charm and style still attract fans. Once the most popular form of public transport in major cities like Tokyo and Hong Kong, there are only a handful of places left where you can still hop on a rickshaw. Below we tell you about their history, the role of rickshaw drivers and where you can still catch a ride. The classic definition of what is a rickshaw is a cart that can seat one or two people powered by a human runner – on legs - modern bicycle and auto rickshaws don’t count. The cabin is mounted on a pair of wheels and the runner carried two sticks used to fulcrum the rickshaw. While the poster book image of rickshaws often includes oriental flourishes to the design, the truth is most were more functional contraptions. Who invented the rickshaw is a hotly disputed issue, with Japan, the UK and the USA all claiming ownership. What we do know is that rickshaws first became popular in Japan during the 1870’s and that the word rickshaw comes from the Japanese word jinrikisha, which means human powered vehicle. It is said to have been invented in Japan by a European missionary to carry around his invalid wife. At one point the country had 21,000 licensed rickshaw drivers. By the turn of the century, the rickshaw had reached India and China, where it really took off. Thousands were produced and they became the favored form of transport for the colonial elite, both to escape the sweltering heat and show off their bank balance. It was in these countries that the image of a fat colonialist being pulled around by a bent over local became infamous. Where Can I Find a Rickshaw? The rise of the bus and other forms of public transport killed off almost all rickshaw business by the end of World War Two. Mao banned them completely from China as a symbol of working-class oppression in 1949, while India and most other Asian countries followed suit soon afterward. 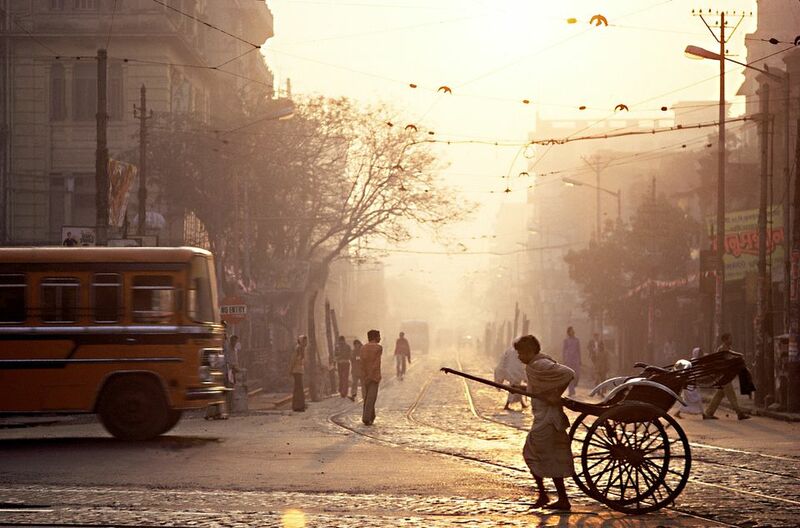 The only large scale operation of rickshaws still on the streets is in Calcutta. Here rickshaw runners unions have ferociously fought bans and an estimated 20,000 carts still ferry passengers around the city. By contrast, Hong Kong has just three rickshaws still in operation, almost exclusively aimed at tourists. Other cities where the rickshaw still runs around include London, Dublin and LA, where they are used as tourist attractions in certain areas. Just don’t expect the bargain prices from the old days. Part and parcel of the rickshaws downfall was the conditions endured by drivers. Their role as ‘human horses’ became increasingly distanced from modern values. Rickshaw runners usually worked long days for poor pay and the rickshaw acted as their own mobile home, where they also slept. In Asia – at the turn of the century - it was often the only job immigrants from the country to the city could find and most lived in poverty. In Calcutta most still do. Drivers carted around people, goods and even policemen; up mountains and through monsoon rains. Many wealthier residents, such as those that lived on Hong Kong’s Peak, used them as their regular form of transport before trams or trains where introduced. When faced with a passenger of sizable weight drivers would ask another driver to lend a hand and charge extra – like a Ryanair luggage charge. The debate over rickshaw pullers in Calcutta rumbles on with human rights groups claiming they are modern day slaves, while many rickshaw pullers claim that a ban would lead to unemployment and starvation. Some people claim that the majority of their passengers are also lower class and that the rickshaws are the only way for them to get around during the knee-deep monsoon rains.